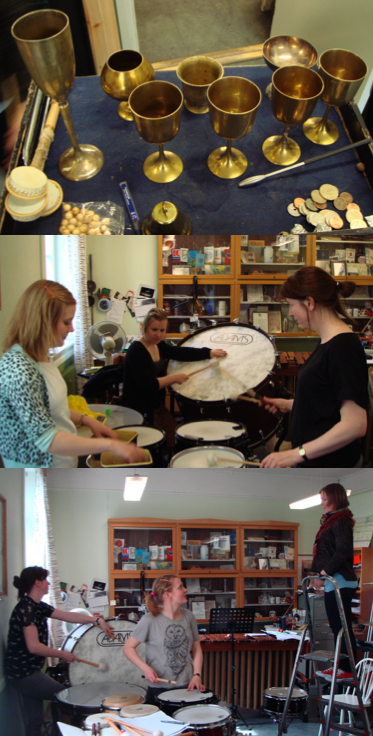 I have recently returned from Oslo, working with the Pinquins percussion trio. We spent our time working out instrumentation for my new piece ‘East of the Sun and West of the Moon’. The piece will be developed around a Norwegian folk tale of the same title. The Pinquins’ workshop was a treasure chest of percussive toys, including a really cool ‘Waldteufel’ and a set of tuned goblets (top, above). We also experimented with synchronising hits from coins being thrown onto a snare drum. This action will have metaphorical significance in the piece, so keep updated for how all these strands will be worked together! The Pinquins were fantastic company and I am very excited about the piece we will create together. Posted on 30/05/2014, in General and tagged Curated Place, Jack White, Norway, The Pinquins. Bookmark the permalink. Leave a comment.